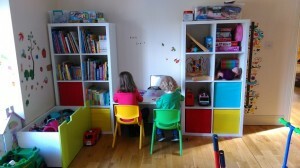 Is your kids playroom driving you bonkers? Mine was! 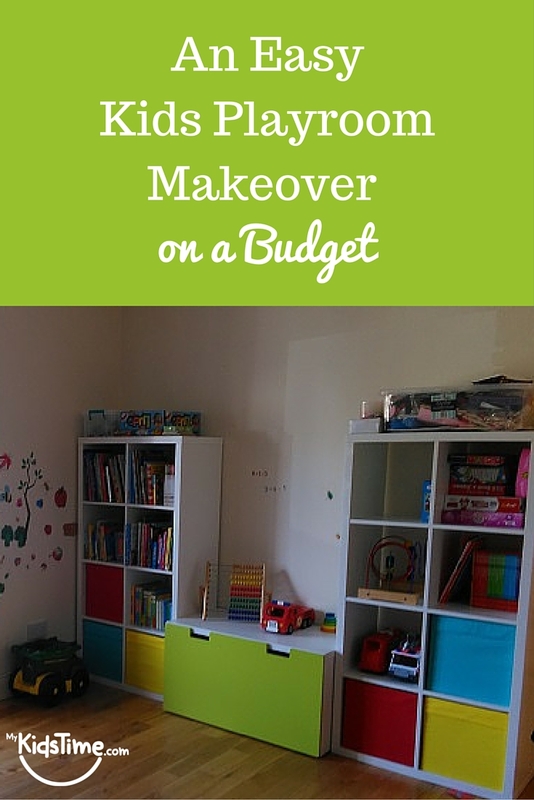 So I transformed our playroom while trying to keep the cost down. 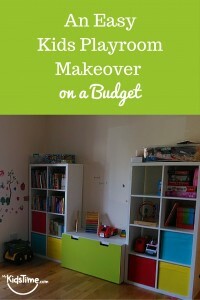 Here’s my easy kids playroom makeover on a budget. 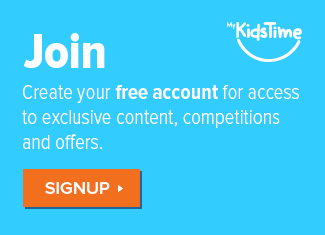 Sign up for our free newsletter packed with information and great offers. Or follow us on Facebook, Twitter, YouTube, Instagram & Pinterest. 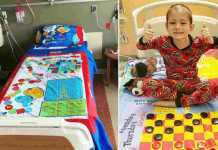 The room just hadn’t been ticking any of those boxes for quite some time! The image below is from before the revamp. 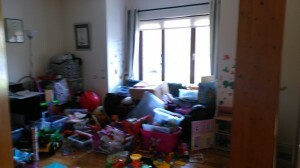 We had loads of boxes all over the floor, way too many toys and not enough room for me to work or the kids to play. You get the idea. And it was so full of stuff, we even had an extra sofa in there that I had been meaning to move for months as well as an old bookcase that didn’t hold enough (and was also falling apart!). So I decided enough was enough and sat down to make my room revamp plan. The bookcase and sofa would go, we needed to buy storage and rearrange the room. I logged onto the Ikea website for inspiration. I love Ikea, I love their designs with clean lines, their brilliant ideas, and most of all, their low prices. 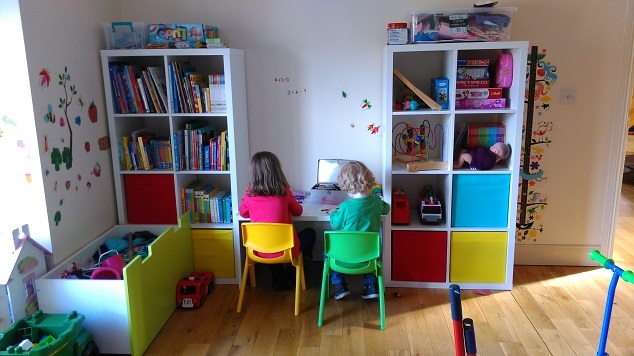 I wanted two storage units, not too high so the kids could reach, and a desk in between so that they could do colouring or build Lego in the playroom too. After many visits (about twenty!) to the Ikea website, I had narrowed down the options to their Kallax storage units, Drona boxes and the Stuvva Bench and Storage Unit. We decided on white units to bring more brightness to the room, it only gets early morning sun so needs the extra help. With a plan, a shopping list and lots of positivity I headed for Ikea. I live about a 2 hour drive away from the store in Dublin so my fingers and toes were crossed that everything would be available and that it would all fit the room as planned. Luckily it was available and it did fit! 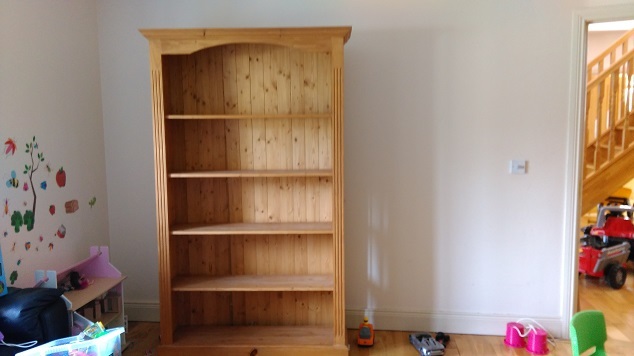 Removed the old bookcase. I needed hubby’s help for this but when I finally nailed him down – out to the shed it went. Moved the sofa to another room. The sofa I was able to move myself with a lot of 3 point turns (more like 19 point turns) into the spare room where it fitted in nicely. Assembled the new Ikea units. I am quite an impatient person when it comes to these things – I like to get everything done straight away and by myself so following instructions sometimes is not my forte! Happily on this occasion all the units were very easy to put together, it took me about 2 hours to get everything put together, standing up and filled. Had a big tidy up and clear out of unwanted toys, etc. We LOVE it! It’s comfortable and welcoming now and ticks all the boxes. The kids are playing in here all the time. It’s a pleasure to come and work here, and even my hubby has come in for a chat – something which never happened before. The Stuva bench in the centre works as a storage space and also a desk. You can wheel the storage box out and hey presto you have a bench. The units fit an extraordinary amount of toys and a good chunk of our ever growing library. And finally the dress up stuff has a home in the storage box. No more boxes on the floor! Now that the room has had a makeover I’m looking at how to decorate the walls and I came across these stylish acrylic photo prints which look cool and a bit different! In case you are interested, we bought two of the Kallax Storage Units which are €49 each plus six of the Drona boxes which are €3 each. The Stuva Bench is €25 and the Stuva Storage Box is €34. In total (obviously not including the toys!) 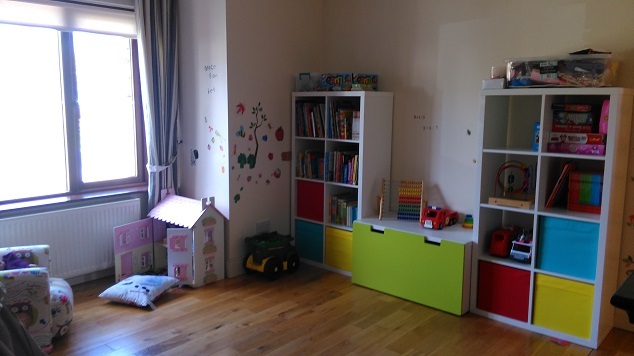 the whole playroom makeover cost €175. Note: I have written this article completely without any endorsement from Ikea, I just happen to be a big fan! 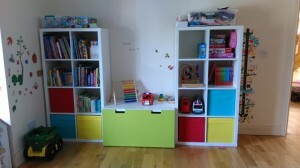 Over to you now, have you revamped your playroom recently? Tell us about it in the comments below.